1. The most prominent feature of a rabbit is their ears, which generally measure about 4 inches in length. Their main purpose is listening for potential predators. 2. Rabbits have one of the fastest reproductive rates of any mammal in the world. 3. In most circumstances, the rabbit’s gestation period is about 30 days. 4. After dogs and cats, rabbits are the third favorite pet in the UK. More than 2 million homes have a rabbit as a pet. 5. The average weight for rabbits is between 2 and 11 pounds. Some weight more, some weigh less. The heaviest rabbit that ever lived weighed in at 50 pounds and the smallest one only weighed about 2 ounces. 6. There are more than 45 different breeds of rabbit existing in the world today. 7. 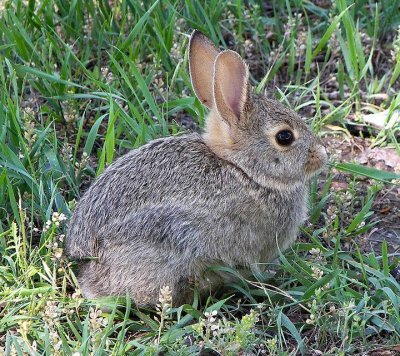 Rabbits can turn their ears in any direction to listen for predators and to help regulate their temperature. 8. Rabbits sweat through their paws. 9. The only blind spot that a rabbit has is directly in front of their nose. Other than that, they can see almost 360 degrees around them without ever turning around. 10. Female rabbits are called does. Male rabbits are called bucks. Baby rabbits are called either kits or kittens. 11. Rabbits can start mating as early as 3 months of age, but they cannot produce offspring until they are 6 months of age. 12. Although the number differs based on the breed, a litter of baby rabbits can range between 4 and 12. While in the wild, a single female rabbit may have up to 8 litters in one year. 13. Baby rabbits cannot open their eyes until about 10 days after they are born. 14. Rabbits can run as fast as 35 miles per hour. They can also do a vertical jump as high as 3.5 feet and they can do a horizontal jump measuring about 10 feet. 15. Rabbits are very social animals. If they are kept as individual pets, they can suffer from depression, loneliness and even aggression. It’s always best to have at least 2 rabbits as pets rather than a single rabbit for this reason. 16. Rabbits do not enjoy being picked up or carried. In fact, their backbone is very fragile and it can be damaged if they are handled improperly. 17. If a rabbit does not get a few hours of exercise each day, they can develop osteoporosis, which is a bone disease. 18. Rabbits have 28 teeth. They continue to grow throughout their lifetime. 19. A domesticated rabbit will typically live to be between 5 and 8 years old. 20. The average rabbit’s heartbeat is between 130 and 325 beats per minute. 21. Rabbits will groom both themselves and other rabbits as a way of socializing. 22. When running away from prey, rabbits will run in a zigzag pattern to slow their predator down and give themselves a better chance of escaping. 23. The courtship and mating process for rabbits lasts between 30 and 40 seconds. 24. More than half of the entire world’s population of rabbits in the world is living in North America. 25. Rabbits sleep for an average of 8 to 9 hours a day.